It’s no secret that H.P. Blavatsky’s master work “The Secret Doctrine” isn’t easy to read. It requires continual effort, attention, concentration, and not just reading but serious study. It takes quite a long time to properly read even a few pages of it because the content is so deep and often of a challenging nature; sometimes intellectually, sometimes philosophically, at other times ideologically. Yet it’s vitally important that all students of Theosophy are directly familiar with its contents and teachings. One cannot rely on the “summaries,” “explanations,” and “interpretations” of others as to what “The Secret Doctrine” says and teaches. Those who do are certain to be misled – sometimes deliberately – or misinformed or, at best, only partially informed, for how can anything be an adequate substitute for the real thing? Read the article Who wrote The Secret Doctrine? and you will see that this book is the work and very often even the words of the Masters Themselves, the Mahatmas M. and K.H., high Initiates of an Eastern Esoteric Brotherhood. The Masters have never said of any other book what they have said about this one. The expenditure of their time, work, and energy, as well as that of the one they called their “Direct Agent” and “Brother” HPB, in the production of “The Secret Doctrine,” was a project almost inconceivable in its import and far-reaching consequences. And if “The Key to Theosophy” is found too difficult, one can begin with the simpler works “The Ocean of Theosophy” by William Q. Judge (HPB’s closest colleague and friend and co-founder with her of the Theosophical Movement) and “Answers to Questions on The Ocean of Theosophy” by Robert Crosbie, founder of the United Lodge of Theosophists and who was a colleague and student of Mr Judge and a direct pupil of HPB. Here are three questions which may be useful to consider when preparing to begin your initial study of the Book of Theosophy. Was “The Secret Doctrine” written for you? It was thus not specifically dedicated to all human beings, nor even to all who call themselves Theosophists, although all may read and benefit from it, but rather “to all True Theosophists.” It was recorded – note the word “recorded” rather than “written”; this is significant – for “the few true ones” as HPB called them, i.e. those students of Theosophy who are serious and in earnest about understanding it, promulgating it, and working for the Theosophical Cause. It is a source of information and instruction for the earnest student. Are you in earnest about Theosophy? Are you a student of Esoteric Science and Ancient Wisdom or at least willing to become one? If so, “The Secret Doctrine” is most certainly for you. “This work is written for the instruction of students of Occultism, and not for the benefit of philologists,” explains HPB on p. 23 of the first volume. If you are one of those people for whom academicism and intellectual scholarliness rank more highly than humility, earnestness, and selfless spiritual aspiration; if you are one who is likely to become critical or even incensed (as some are) by occasional typographical mistakes and minor errors in spelling and grammar; then “The Secret Doctrine” is definitely not for you. Such “mistakes” as these are of no consequence or importance to the sincere student. What is important is the question of whether there are any philosophical, metaphysical, or logical errors in the teachings. It’s 127 years since the book was published and no-one has yet been able to find any. Do you have an authentic edition? The original 1888 version of “The Secret Doctrine” had been out of print and unavailable since 1893, when Annie Besant published the so-called “Third and Revised Edition” of “The Secret Doctrine,” which was found to contain tens of thousands of alterations from HPB’s own text, ranging from minor and unnecessary alterations of words and grammar to major distortions in the form of deletion of entire sentences and paragraphs. In 1925, at great personal expense on the part of some associates of the United Lodge of Theosophists, the original and unaltered “Secret Doctrine” was republished and has remained in print and in demand ever since. Other Theosophical groups later followed suit, so that now both Theosophy Company (the publishers for the ULT) and Theosophical University Press (the publishers for The Theosophical Society – Pasadena) publish the original editions of HPB’s major works in photographic facsimile form. The Theosophical Society – Adyar (which owns the Theosophical Publishing House) hasn’t published or sold the authentic and original editions of HPB’s books for over 100 years and seems to have a distinct aversion to doing so. If they do not have such an aversion, then why don’t they publish them instead of publishing only a very incomplete selection of her books – most of which have been highly edited and abridged – and also at least one book which they claim to have been written by HPB but which was largely written by an anonymous Adyar Theosophist in the 20th century and which presents a distinctly different view of Theosophy than HPB’s genuine writings, namely the “Practical Occultism” book? Sadly they have a long history of publishing deliberately distorted and altered texts. It is not advisable to buy abridged, abbreviated, or edited versions of books by H.P. Blavatsky. If HPB had intended for her books to be shorter then she would have made them shorter…but she didn’t. The reader of abridged and altered books has no way of knowing exactly what details and content they’re missing out on. It has often been found that the people who presumptuously assume the role of “editor” of HPB’s works tend to edit out anything with which they do not personally agree or which they don’t personally like very much, thus leading to a distorted and incomplete end result. Although the “Third and Revised Edition” and its later incarnation as the “Adyar Edition” are now thankfully out of print, the Adyar Society makes available Boris de Zirkoff’s “Collected Writings” edition of “The Secret Doctrine,” which itself contains numerous alterations, additions, deletions, and presumptuous “improvements” and annotations, some of which are even more audacious than the work of Annie Besant and G.R.S. Mead in their 1893 doctoring of this monumental book. There is nothing which is actually inconsequential or outdated in the writings of HPB, as those who have studied them in the form that she originally wrote them will unhesitatingly affirm. All of it is still very relevant today and some of it even more so than when originally written. When it comes to purchasing a copy of “The Secret Doctrine,” the only entirely unaltered and verbatim editions of the original text published today are those published by Theosophy Company and Theosophical University Press. These are available at more or less the same price as one another, the only real difference between the two being that the Theosophy Company edition contains both volumes bound together in one big hardback book while the Theosophical University Press edition is published as two separate books but which are sold together, either in hardback or paperback form. “The Secret Doctrine” consists of two volumes, titled “Cosmogenesis” and “Anthropogenesis.” The so-called “Third Volume” or “Volume 3” of “The Secret Doctrine” is not an authentic part of this work and is not what it claims to be. It too was a Besant publication, being published by her in 1897, and consisting of some of HPB’s unfinished articles, writings, and other documents – edited and altered by Besant again – which she herself had never wished to publish, due to their incomplete or private nature. Do you have the right approach and motive? You are probably already interested in studying and understanding “The Secret Doctrine” or you wouldn’t have already read this far into the article. But have you stopped to ask yourself why you are interested? With what attitude and motive are you approaching this? Theosophy, being the Theosophia or Divine Wisdom, is the perfect and naturally occurring synthesis and unity of these three, which are the three aspects or facets of Timeless Truth. We must endeavour to study from a joint religious-philosophical-scientific perspective, one which integrates and unites our intellect, intuition, and actions. If you happen to already have for some reason a critical or negative view of HPB, or if you are one of those misguided and ill-informed individuals who naively believes and accepts the unsubstantiated and unsupportable claims and assertions of later “Theosophical” teachers that HPB was only a type of preparatory forerunner for them and their teachings, or if you are intending to read and interpret “The Secret Doctrine” through the lens of any teaching, philosophy, or form of “Theosophy” other than the pure and unadulterated original, it would probably be best for you not to bother with it. All these things will narrow your perceptions and limit your clear comprehension. Similarly, if you are reading it with the intention of unthinkingly and more or less blindly believing and accepting as true everything it says, this is not the right approach or attitude either. If you are looking and hoping for a belief system to replace or improve upon an existing belief system or creed, then neither you or “The Secret Doctrine” are particularly suited for one another. For HPB and her Mahatmic inspirers, the teachings and information presented throughout the book are not hypothesis but knowledge, not speculation but fact, not theories but a Record of Truth obtained through initiation into the sacred Mysteries of the Cosmos. The book was not merely written but “recorded.” It stands as a Record of Archaic Knowledge. But never did they wish or ask any of their readers or students to believe or accept it in such a lofty light, at least not until they had carefully and open-mindedly studied, analysed, scrutinised, and thought it over for themselves. The book contains many specific and definitely worded statements but it neither demands nor requests belief or acceptance. Theosophy is a very definite Teaching but the last thing the Masters would want is for anyone to accept it blindly and give credence to it as to an “authority” without having held it up to the tests of reason, philosophy, logic, and likelihood. Such an attitude as the former breeds dogmatism and dogmatism should have no place in Theosophy. “Knowledge and not belief is what H.P. Blavatsky offered. If today the world of knowledge does not to a greater extent examine her teachings it is because her many followers are denizens of the world of belief; alas! even a greater number, adopting the appellation of her system of thought, display crass ignorance of it. “With humility but with self-confidence the student should begin his task, but he must persevere in his communion with the book regularly and punctually day by day. IF YOU ARE READY TO BEGIN THE STUDY, HERE ARE SOME SUGGESTIONS OF WHERE AND HOW TO START. Those who may choose to follow this reading pattern should find that they end up with a good overview of “The Secret Doctrine” and then find it much easier to study and understand the whole book in more depth and detail. It’s always good to come back to these sections and passages and re-read them from time to time, until their main points and statements are imprinted in both our head and heart. Each new reading brings new insights and further light shed on both familiar and unfamiliar truths. 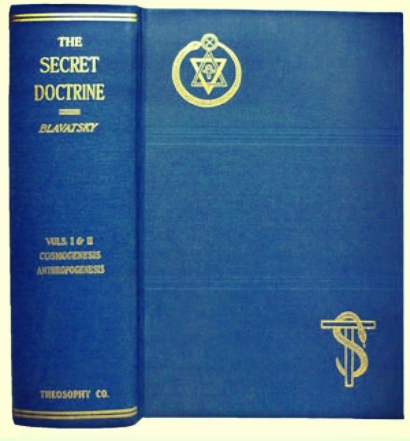 Further aids in the study of “The Secret Doctrine” can be found in “Transactions of the Blavatsky Lodge” and “The Secret Doctrine Dialogues,” both books by HPB, along with Mr Judge’s “Hidden Hints in The Secret Doctrine” and B.P. Wadia’s “Studies in The Secret Doctrine” and “Some Observations on The Study of The Secret Doctrine,” all of which are published by Theosophy Company and available from the United Lodge of Theosophists. An “Index” volume is invaluable, particularly for those who wish to study particular topics or subjects within “The Secret Doctrine.” The Theosophy Company Index volume is good but the 1997 Theosophical University Press Index to “The Secret Doctrine” is far more complete and comprehensive, totalling 433 pages. You can click here for more details about available Theosophical literature. Emails we receive from visitors to this site, along with search terms used by people who find the site, show that all over the world are people interested in reading, studying, and understanding “The Secret Doctrine” for themselves. It is hoped that this present article will go some way to assisting with that. Other articles which may help are An Invitation to The Secret Doctrine, Who Wrote The Secret Doctrine?, Golden Keys to The Secret Doctrine, The Essence of The Secret Doctrine, Human Evolution in The Secret Doctrine, The Importance of Supporting Evidence, The Many Missing Texts of Esotericism, How to successfully study the Teachings of H.P. Blavatsky, and Theosophy – An Explanation and Overview. Neither the Masters nor HPB have any sympathy for “the modern esoteric student” who “demands and expects that his “Path” shall be engineered with all the selfish craft of modern comfort, macadamized, laid out with swift railways and telegraphs, and even telescopes, through which he may, while sitting at his ease, survey the works of other people; and while criticizing them, look out for the easiest, in order to play at the Occultist and Amateur Student of Theosophy. The real “Path” to esoteric knowledge is very different. Its entrance is overgrown with the brambles of neglect, the travesties of truth during long ages block the way, and it is obscured by the proud contempt of self-sufficiency and with every verity distorted out of all focus. To push over the threshold alone, demands an incessant, often unrequited labour of years, and once on the other side of the entrance, the weary pilgrim has to toil up on foot, for the narrow way leads to forbidding mountain heights, unmeasured and unknown, save to those who have reached the cloud-capped summit before. Thus must he mount, step by step, having to conquer every inch of ground before him by his own exertions; moving onward, guided by strange land marks the nature of which he can ascertain only by deciphering the weather-beaten, half-defaced inscriptions as he treads along, for woe to him, if, instead of studying them, he sits by coolly pronouncing them “indecipherable.” The “Doctrine of the Eye” is maya; that of the “Heart” alone, can make of him an elect. To be able to say “Thus have I heard,” one has to have heard. Let us sit “at the feet” of HPB, the Teacher of Theosophy, and earnestly listen to what the Great Ones wish to tell us about the nature of life, the nature of the Universe, and the nature of REALITY ITSELF. Thank you for your great article. I have just realized that I do not own an original edition of the Secret Doctrine. Is everything that is published by “Adyar” not original? Also the german version? I have owned this one for long years and would like to buy the original now. Can you please tell me how to get the real original Secret Doctrine? Maybe with ISBN no. In english please. I don’t need it in german. Almost all of HPB’s works published by the Adyar Society (i.e. Theosophical Publishing House and Quest Books) are altered, edited, or abridged, in some way. The German translation of “The Secret Doctrine” is a translation from Annie Besant’s “Third and Revised Edition” of “The Secret Doctrine,” which has thousands of differences (mostly very minor but still unnecessary and inappropriate) from the original. In fact, most of the non-English editions are from the “Third and Revised Edition,” such as the French, Spanish, and Russian, although some Theosophists are now translating the original 1888 edition into those languages. You should be able to find both for sale on Amazon. If not on the German site then you could try amazon.co.uk and amazon.com. It’s also possible to purchase the Theosophy Company edition direct from a United Lodge of Theosophists centre, who could send it to you by mail. If you’re in Germany, the nearest ones to you are Paris (see https://www.espacetheosophie.fr/ and http://www.theosophie.fr/) and London (see http://www.theosophy-ult.org.uk/). I have the Quest Books / Boris Zirkoff edition which was gifted to me and the Tarcher Perigree 2016 paperback. Could you please comment or make example of what unforgivable edits were made in these as I’m unsure of which to keep and which to ship on. I’m interested in what’s wrong with the Zirkoff edition in particular as you made special mention of it being more egregious than Besant/Mead without example. Thankyou for a very informative article. Hello Luke, thank you for your enquiry. In his “Editorial Foreword” to “The Secret Doctrine,” Boris de Zirkoff acknowledges that he has made alterations to HPB’s text, ranging from changing words, changing punctuation, changing spelling, adding words, altering quotations, adding references to authors who HPB quotes from, redrawing diagrams, adding lots of photos and pictures of people and places referred to in the text, and adding his own comments and criticisms in an editorial Appendix at the end of each volume. One can thus compare page 1 of the de Zirkoff edition with page 1 of HPB’s edition and find no less than eight changes, just on one page. We do not have the time to compare every page of both editions but if eight alterations can be made on just one page, how many must there be throughout the whole two volumes? This is something that students of the original Theosophical teachings have been aware of for quite some time; please see old online forum posts at http://theos-talk.com/archives/200105/tt00144.html, http://theos-talk.com/archives/200105/tt00152.html, http://theos-talk.com/archives/200105/tt00123.html, http://theos-talk.com/archives/200307/tt00195.html, for just a few examples of how de Zirkoff completely rewrites some of HPB’s sentences, deleting words, adding words, and changing meanings, and usually without specifically identifying it as such, thus leaving the innocent reader unaware that what they’ve just read is not the way HPB wrote it at all but a modern day distortion. Regarding the Tarcher Pedigree 2016 paperback, this is probably far closer to the original, although we have heard that it contains some misprints and textual alterations caused by insufficient proofreading. To cut a long story short, it is far better to just stick with the books in exactly the way that HPB herself wrote and published them. Please see our “Books on Theosophy” page at https://blavatskytheosophy.com/books-on-theosophy/ for information regarding these.